Offer valid from 12:﻿00 A﻿M ET Mar﻿ch 20, 20﻿19 through 11:﻿59 PM PT Ma﻿rch 20, 20﻿19. 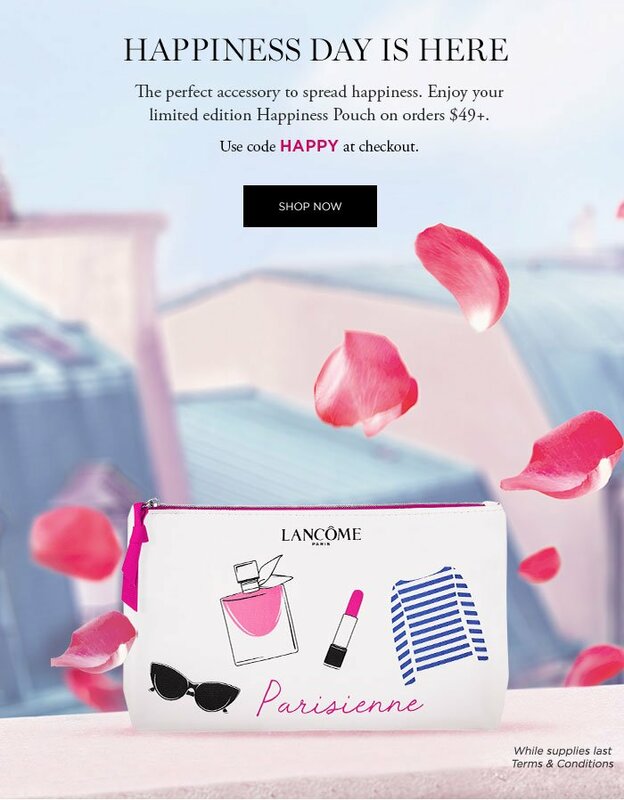 Offer only available on lancome-usa﻿.c﻿om while supplies last. Offer may not be combined with any other sample offers, additional discounts, including Birthday 15% discount and Welcome 15% discount. 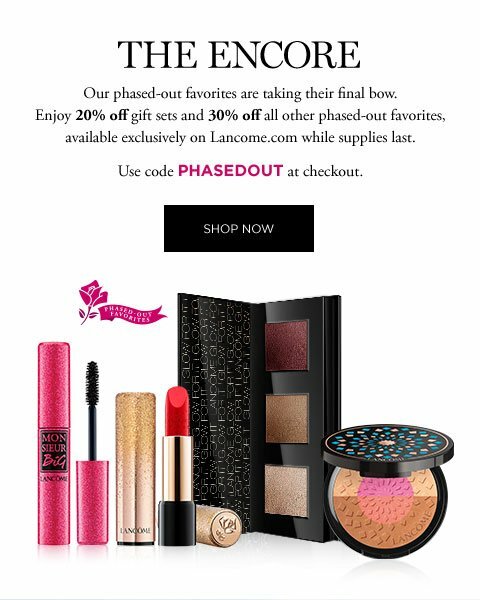 Offer not valid with the purchase of makeup gift sets, skincare gift sets or fragrance gift sets. Offer not valid with e-gift cards purchases. Free Shipping offer is for Standard Shipping [3-5 business days] with orders of $49 or more after discount. Offer cannot be applied to order placed before or after 12:﻿00 AM ET Mar﻿ch 2﻿0, 20﻿19 through 11:﻿59 PM PT Mar﻿ch 2﻿0, 20﻿19. We reserve the right to substitute any deluxe sample offered with another sample of equal or greater value. The following products (all sizes) are EXCLUDED from all discount offers: Advanced Genifique serum, Genifique Eye Cream, Tonique Confort, Renergie Lift Multi-Action Day cream (for all skin types), Renergie Lift Multi-action Light cream, Renergie Lift Multi-action Eye, Renergie Lift Multi-action Night Cream, Renergie Lift Multi-action Day cream (for dry skin), Renergie Lift Multi-action Ultra lotion. Ongoing offers are subject to change without notice. Samples only applied to cart if the order total after discount exceeds the specified qualifier. Other restrictions may apply. Offer valid from 1﻿2﻿:﻿00 A﻿M E﻿T Ma﻿rch 16, 2﻿019 through 11﻿:﻿5﻿9 P﻿M P﻿T Ma﻿rch 18, 2﻿019. 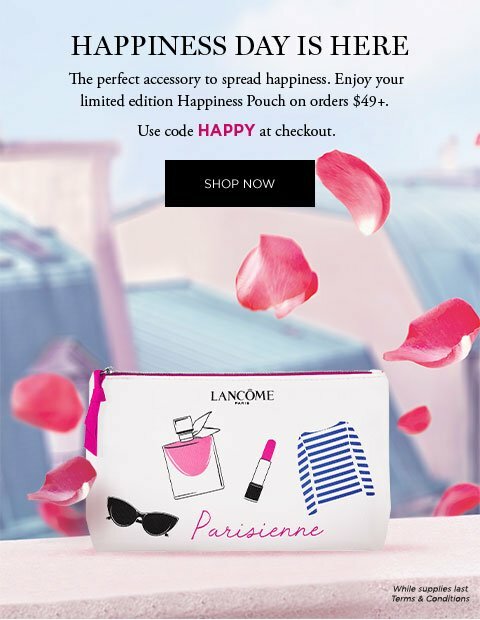 Offer only available on lancome-usa﻿.﻿c﻿om while supplies last. Offer may not be combined with any other sample offers, additional discounts, including Birthday 15% discount and Welcome 15% discount. 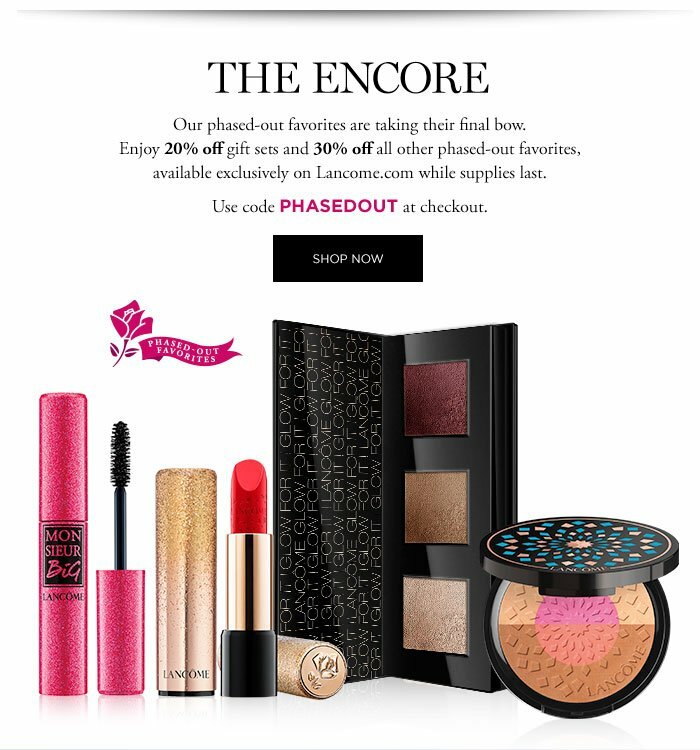 Offer not valid with the purchase of makeup gift sets, skincare gift sets or fragrance gift sets. Offer not valid with e-gift cards purchases. Free Shipping offer is for Standard Shipping [3-5 business days] with orders of $49 or more after discount. Offer cannot be applied to order placed before or after 12﻿:﻿0﻿0 A﻿M E﻿T March 16, 2019 through 11﻿:﻿59 P﻿M P﻿T Ma﻿rch 1﻿8, 2﻿019. We reserve the right to substitute any deluxe sample offered with another sample of equal or greater value. Ongoing offers are subject to change without notice. Other restrictions may apply.